Rabbi and physician; born at Frankfort-on-the-Main about the middle of the seventeenth century; died at Mayence in 1714. He studied medicine and philosophy in Padua, where in 1674 he obtained the degree of doctor of medicine and of philosophy. About a year after his return to Frankfort, David Claudius of Giessen solicited his collaboration on the Bible which he was about to edit with Latin annotations. The young scholar accepted the offer, and he wrote a preface to the work (Frankfort, 1677). 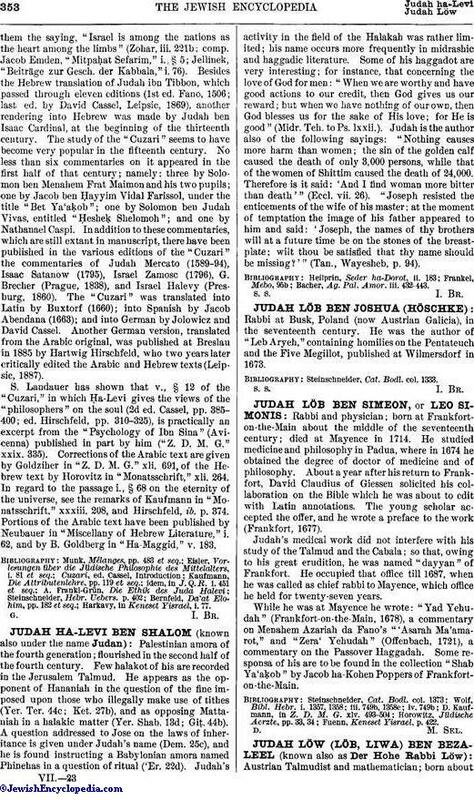 Judah's medical work did not interfere with his study of the Talmud and the Cabala; so that, owing to his great erudition, he was named "dayyan" of Frankfort. He occupied that office till 1687, when he was called as chief rabbi to Mayence, which office he held for twenty-seven years. While he was at Mayence he wrote: "Yad Yehudah" (Frankfort-on-the-Main, 1678), a commentary on Menahem Azariah da Fano's "'Asarah Ma'amarot," and "Zera' Yehudah" (Offenbach, 1721), a commentary on the Passover Haggadah. Some responsa of his are to be found in the collection "Shab Ya'aḳob" by Jacob ha-Kohen Poppers of Frankfort-on-the-Main. Fuenn, Keneset Yisrael, p. 422.